Keyboard shortcuts are a handy feature to have in any application. As a matter of fact, many computer users choose to interact with different online and desktop applications using the keyboard. That is why we provided a set of shortcuts you can use for creating, converting and editing PDF documents with PDF Converter Elite. 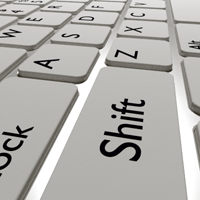 Keyboard shortcuts can be true time-savers if you are aware of them. All shortcuts available for PDF Converter Elite are prominently displayed in the application itself. You can find them next to each command on the six dropdown menus of the Menu bar. For your convenience, listed below are keyboard shortcuts for the 10 most used options in PDF Converter Elite 3. Use Ctrl + O to bring up the Open dialog in a split second and choose the file that you want to open and convert, be it a PDF document, .tiff, .bmp or .jpeg. Just press Alt + C on your keyboard and choose a document in virtually any Windows file format to convert to PDF. Ctrl + A is a widely-used and handy shortcut for selecting all pages of the active document in PDF Converter Elite, no matter how long that PDF may be. If you frequently use the PDF to Word conversion option in PDF Converter Elite, then Ctrl + D is the keyboard shortcut you will want to memorize. PDF to Excel is the most used conversion option in PDF Converter Elite. 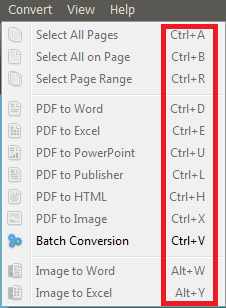 The shortcut for all of you who need this conversion often is Ctrl + E.
Hit Ctrl + V and select multiple PDFs to convert into the desired format. Do pages in your opened and active PDF have too much white space around? If the answer is “yes,” you may want to crop the margins. Simply press Alt + X on your keyboard and the dialog for cropping pages will appear. Alt + M is the keyboard shortcut for merging multiple PDF documents into one. Ctrl + G is a very useful shortcut to quickly navigate PDFs with lots of pages. Done managing your PDFs for now? Then use Ctrl + Q and exit PDF Converter Elite. OK, here’s one more shortcut for all our satisfied users. If you like PDF Converter Elite and find it useful, then, please, before you close PCE down for the day, hit F3 and tell your friends about it!